One of the few penstemons found in the Puget Sound lowlands, cascade penstemons are beautiful wildflowers at home in the landscaped border. 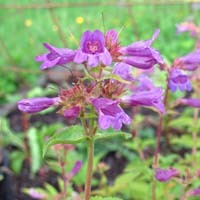 This perennial wildflower has trumpet-shaped, purple flowers that draw hummingbirds. Cascade penstemon tolerates more moisture and shade than most other penstemons.